Using copper in your home decor is really trendy and can make it look really sophisticated when used the right way. Copper is well known for adding warmth, glamour and depth to your space while still looking really modern. Let’s explore the awesome ways we can use this wonderful colour in your home. Adding a feature wall in your bedroom in a gorgeous copper colour makes it look really rustic and modern at the same time. Keep the rest of your decor neutral so that it doesn’t steal the show from your beautiful wall. If you want a more unique approach to using copper in your home then you can consider going for metallic copper wallpaper to really dress up your walls. Best of all, you can save money on the rest of your decor to keep it minimalist so that your walls can take center stage. This kitchen may seem like any ordinary kitchen until you notice its great copper stove that makes it look elegant and rustic at the same time. The matching copper cookware just makes it look even more exquisite. Looking for a quick way to transform your dining room? You can consider changing the shades of your pendant lights into this shimmering copper ones that will surely make a statement in this classy dining room. This charming bedroom is a beautiful display of copper done right. From the copper bed frame, hanging lights, bedding and even the patterned pillow, it is splendidly complemented with the blush pink walls and neutral coloured elements in the room. Incorporating a copper bathtub into your bathroom is a surefire way to glam it up and make you feel like royalty. Coupled with the other elaborate furnishings, this bathroom looks luxurious. Create a dazzling home for your plants with some magnificent copper coloured pots. You don’t even have to use any special pots, just spray paint some copper colour onto clean cans for the desired effect. 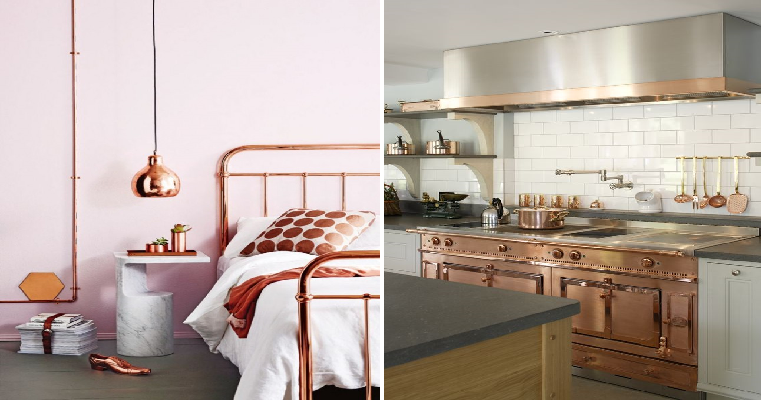 Copper is a truly versatile colour that can be used for both modern and vintage styles. In this sleek and modern bathroom, copper accents such as the glimmering copper sink and copped edged mirror complete the look. This contemporary living room would look rather bland with its neutral colours but the dazzling copper coffee table makes an interesting statement. You can add a pot of fresh plants in the living room to liven it up. This elegant farmhouse kitchen is already lovely enough with the marble and natural elements that are used. With the addition of the weathered copper hood, it looks even more stunning.